Senator James Inhofe seems about fed up with his Oklahoma friend, ally, and protégé Scott Pruitt. 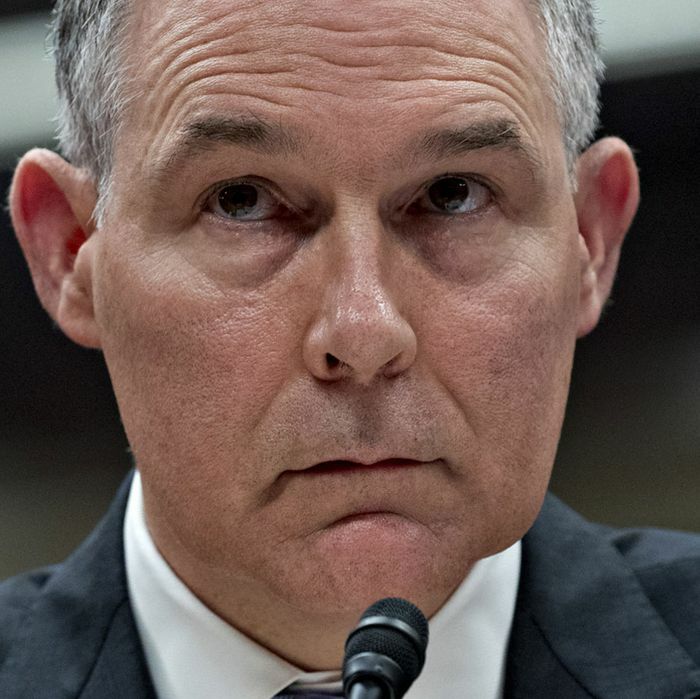 It sometimes seems that EPA administrator Scott Pruitt has some sort of cloak of immunity gathered about him that keeps him from being submerged by an almost endless series of incidents that exhibit venality, conflicts of interest, and a complete indifference to the most basic ethical standards, concluding most recently with multiple examples of Pruitt using his position and his taxpayer supported staff to get a job for his wife. Among the president’s other confidants is Scott Pruitt, the administrator of the Environmental Protection Agency. Mr. Trump has dismissed the advice of several aides who have tried to persuade him to fire Mr. Pruitt in light of the growing questions about misuse of his authority. The two speak frequently, and the president enjoys discussing his negative view of Jeff Sessions, the attorney general, with the embattled E.P.A. leader. Inhofe also helpfully observed that Pruitt’s deputy, Andrew Wheeler, is highly qualified, so “that might be a good swap.” In other words, there are plenty of people the administration can find to gut environmental regulations and promote the fossil-fuel industry — Pruitt’s hardly indispensable. This message should be particularly alarming for Pruitt since he has long been considered a potential successor to Inhofe in the Senate when his term ends in 2020 (he’ll then be 85). Since Inhofe has zero issues with Pruitt’s positions on official EPA matters, he’s making it clear that his abuses of his office are way over the line. And the scary thing is that even if Pruitt cleans up his act right away, there’s an ever-present chance that something inappropriate he’s already done will soon come to light. That’s how it works when you are a walking toxic-waste dump. Pruitt better fully tap whatever emotional credit he has with the president. But he has to wonder if Ingraham and Inhofe would be bad-mouthing him without some sort of green light from the White House.